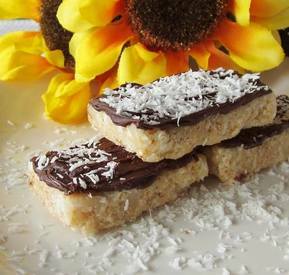 Chocolate dipped coconut krispy bars! These crispy bars are made with natural sweetener, coconut (the latest super-food, right? ), gluten-free brown rice crispies, and chocolate (well-established as a super-food – that’s my story and I’m sticking to it!). Still dessert-like, but with wonderful whole food ingredients … dare I say this could be the perfect rice crispy bars recipe.